Former President Bill Clinton has given unequivocal backing to US Democratic presidential nominee Barack Obama, saying he "is ready to lead America". 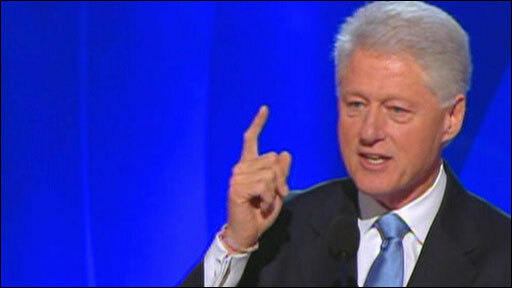 He was the man to restore US leadership in the world, Mr Clinton told Democrats gathered at their convention in Denver. Mr Obama made a surprise appearance on the stage after Joe Biden accepted his own nomination for vice-president. Mr Obama, the first African-American to be nominated by a major US party, will speak later on Thursday to accept. Appearing at the end of Mr Biden's address, Mr Obama joked that the party's convention was "going pretty well" and praised his wife, Michelle, and Hillary Clinton for their speeches. He said the final convention event, to be held in a sports stadium in front of more than 70,000 people, was designed to demonstrate that change comes from ordinary people doing "extraordinary things". "We want to open up this convention to make sure that everybody who wants to come can join in the party, and join in the effort to take America back," he said. The presidential election on 4 November will pit Mr Obama against Republican John McCain, who will be nominated next week at his party's convention in Minneapolis-St Paul. The last Democratic president, Bill Clinton, was given an enthusiastic welcome by convention delegates, watched by his wife, Hillary, and their daughter, Chelsea. In an address that was bound to be closely scrutinised for signs of discord, he struck a firmly conciliatory note and stressed that he believed Mr Obama was ready to be president. He said he was proud of his wife who had battled Mr Obama for the Democratic nomination but that her supporters should now back Mr Obama. "Last night Hillary told us in no uncertain terms that she is going to do everything she can to elect Barack Obama. That makes two of us. "Actually that makes 18 million of us - because, like Hillary, I want all of you who supported her to vote for Barack Obama in November." The former president spoke of Mr Obama's "remarkable ability to inspire people" and said he had made a great choice of running mate in Mr Biden. He went on: "Barack Obama is ready to honour the oath to preserve, protect and defend the Constitution. Barack Obama is ready to be president of the United States." Mr Clinton drew a comparison between Republican attacks on Mr Obama over his inexperience and youth and criticisms he himself suffered in 1992. "Sound familiar? It didn't work in 1992, because we were on the right side of history. And it won't work in 2008 , because Barack Obama is on the right side of history." Not everyone was convinced Mr Clinton was ready to deploy his oratorical skills in support of the man who beat his wife to the nomination, the BBC's Kevin Connolly in Denver says. But he banished any doubt in a speech in which he said simply that Barack Obama was ready to be president, our correspondent says, a sentence Obama strategists must have started to fear they would never hear from him. In American political parlance Mr Clinton "delivered", and may now find himself playing a higher-profile role in the campaign to come, our correspondent adds. Mr Biden, chosen last week by Mr Obama to be his running mate, said he was honoured to share the stage with Mr Clinton. He praised Mr Obama and drew parallels between their lives and values, growing up in families that had little but worked hard. "Barack Obama and I took very different journeys to this destination, but we share a common story," he said. He stressed the need for a new approach to help Americans struggling to make ends meet and to change US foreign policy in the rest of the world. The 65-year-old foreign policy expert was chosen as vice-presidential candidate by 47-year-old Mr Obama partly on account of his experience. Earlier in the day, Mrs Clinton earlier halted a roll call vote - in which each state, in alphabetical order, declares how many votes were cast for each candidate in the primaries - to call for Mr Obama's nomination by voice vote. In a powerful show of unity, she said: "Let's declare together in one voice, right here, right now, that Barack Obama is our candidate." 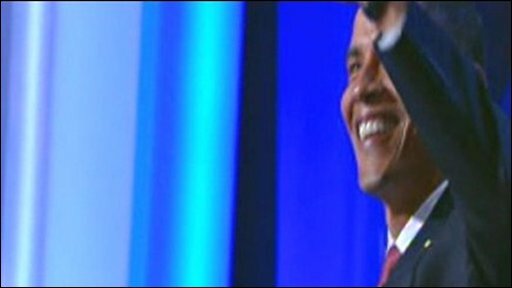 Mr Obama's confirmation by acclamation as the party's presidential candidate was by greeted by loud cheers from the convention floor. Mrs Clinton had released her delegates - supporters won by her during the primaries - freeing them to vote for Mr Obama. "This has been a joy. We didn't make it, but boy did we have a good time trying," Mrs Clinton said in a speech to about 3,000 people ahead of the roll call. Many in the crowd shouted back "No!" as she released them, but Mrs Clinton urged them to put the party first. "We will leave Denver united," she said. "My goal is that we win in November." The roll call for the nomination included Mrs Clinton's name in a bid to placate her disappointed supporters.